Over 30,000 Chicagoans visited Car2Go installations and activations throughout July and August. For Car2Go’s launch campaign in Chicago, it drew inspiration from the city’s residents’ extreme efforts to claim "dibs" on decent parking spots in the winter. The campaign included a variety of installations and activations that took place over the summer in Chicago, aimed at driving awareness and membership sign-ups for Car2Go, an hourly car rental service that doesn’t have rental offices or return stations. Planning for the campaign began in January 2018, however Car2Go’s business development team had been working with Chicago aldermen for over five years to bring the pilot to life, explained Brandon Nehrkorn, regional marketing manager at Car2Go. The campaign team planned a series of pre- and post-launch activations in the city to help reach a large, local audience and drive membership sign-ups. "Specifically, we developed experiential and creative untraditional out-of-home concepts that demonstrated our shared love of iconic visuals, music, and enjoying where we live, work, and play, all of which drove significant earned coverage," said Nehrkorn. In terms of media outreach, the team focused on reaching local and regional media, as well as national lifestyle media to share the story of the company’s continued growth. In early July, Edelman staffers began outreach to a multitude of local and regional publications, announcing the upcoming Car2Go launch. Throughout July, United Entertainment Group deployed street teams at a variety of high-traffic festivals, including Volleywood, a Chicago-based beach volleyball tournament on July 14, and Pitchfork Music Festival from July 20-22 in Union Park to engage with residents and drive Car2Go sign-ups. The team also worked with nine local lifestyle influencers to generate awareness around the launch, including Meghan Wainwright, a blogger with nearly 60,000 Instagram followers. Wainwright crafted a blog post about the Car2Go activation at Pitchfork. On July 25, Car2Go officially launched the Chicago service with 400 cars. That morning, Car2Go’s global executives joined Chicago aldermen and the Jesse White Tumblers, a storied Chicago-based acrobatics team, to celebrate the launch, showcase vehicles, and share remarks about what the company brings to the city. Several on-site broadcast interviews were secured, along with coverage in outlets like the Chicago Sun-Times, Streetsblog Chicago, and Crain’s Chicago. In the weeks following the launch, Edelman partnered with a local artist to create art installations in high foot traffic areas of the city. 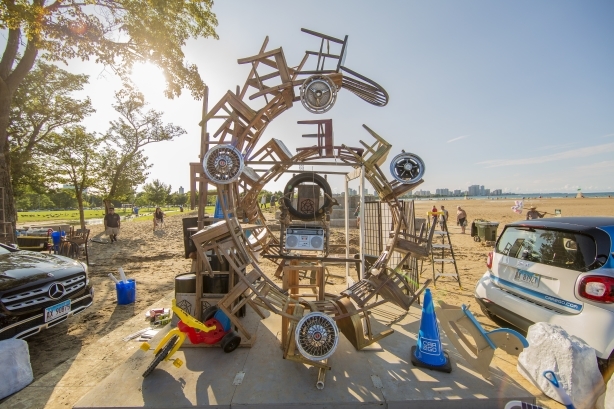 The installations were designed to highlight the lengths Chicagoans go to in order to claim "dibs" on decent parking spots in the winter, often using folding chairs, cones, and other items to reserve a spot. The Car2Go campaign led to more than 45 Chicago-specific media placements. The campaign was covered by Chicago Tribune, Inside Hook Chicago, 97.1 The Drive, and WGN.com. Over 30,000 Chicagoans visited Car2Go installations and activations throughout July and August, with over 18,000 Chicagoans receiving company swag. "Even before Car2Go launched in Chicago in July, Car2Go’s app was opened over 10,000 times each month, or about 360 times each day, by Chicagoans looking to access the service," added Nehrkorn. Car2Go could not disclose membership sign-ups or how often its app was opened by people in the area post-launch. Through partnerships with the brand, influencers posted about Car2Go 70 times total, generating 22,921 engagements across social channels.